I got to be part of a podcast recently with the Super Bitter Infertiles. As part of her Faces of ALI series, JJiraffe interviewed me, along with Mo and Cristy (Shelley was on vacation and I didn’t get to “meet” her). We laughed, we cried. It was better than Cats. The gals chat first about TTC (trying to conceive) stuff, then I join the party at 44:00 for about 25 minutes. Why I don’t blog in real time when significant storylines in my life are unfolding. The hard-stop of my TTC journey and how it almost killed me. But didn’t! What two things I did to survive my failure-to-thrive period. The book that put me back in the driver’s seat, family-building-wise. How — and why — I embraced open adoption. The gals then top off the podcast dishing about Snooki, Holly Madison, Honey Boo Boo’s mama, a Kardashian (the one whose name starts with a K), Megan Fox, and a bunch of other names that I can legitimately put in this post and thusly show up more often in search engines. Thanks, ladies! How do they make bitter so fun? 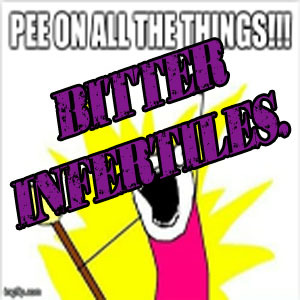 Take a listen and subscribe to future podcasts of the Super Bitter Infertiles. Previous PostTime Warp Tuesday: 9/11Next PostVote 2012: How well does your candidate really match your values? That is so cool! I have to go listen. JJ said it better than I ever could. You rock! That was a great podcast! I’m eagerly awaiting your book. I love how you talked about getting over our insecurities for the health of our children. On the outside, I have been “pretending” that I don’t have any (personal) insecurities about our open adoption, but I really do on the inside. I’m working on having my pretend self convince my inner self to see the light. 🙂 It gets a little better every day though…. Trying to figure out when I can devote 1.25 hours to listening! It sounds veeeerrrry interesting. Very cool! I’ll have to check it out. Lori, I heard the podcast and your voice sounds just like I imagined it. Weird, huh? I wanted to let you know that I finally posted the response to the article on magical thinking. I don’t expect you to link it but I wanted you to know. It makes me a little nervous because I tend to write about personal stories and try to stay away from writing just on convictions. I have yet to have a mean comment in the two years I’ve been blogging (I know, rare, right?) but I really felt compelled to respond that there is a middle ground between “God made this child just for me” and “God has nothing to do with this.” You may still disagree with me, but I hope at least you can “hear” in my words the sorrow I felt at those comments made in the article. I’m with Mo and Jjirafe: it was wonderful “meeting” you! Thank you for a wonderful conversation. It’s one I will always treasure. I have their blog bookmarked & started listening to the first podcast a few days ago; need to get back to it again soon (& listen to your episode too!). Brilliant idea!